You may remember years ago, a handful of beef jerky commercials debuted which featured a “Sasquatch” subjected to various pranks and, consequently, throwing huge fits of rage after each antagonizing incident. The series is still being produced today and the poor creature continues to be tormented by bored forest-goers and people-watchers, but despite his endured pain and suffering, the Sasquatch has never been shown actually getting to enjoy the beef jerky that the ads were selling (to my knowledge.) Maybe this was because Bigfoot doesn’t like beef jerky, and maybe it’s because the world is against Bigfoot, but this sparks an interesting question: assuming Bigfoot exists, what would he eat? Years worth of blurry photographs and possible sightings have led us to assume Bigfoot is some kind of unique, primitive super-species based on his extreme ape-like appearance alone, but first and foremost, he is technically/scientifically classified a cryptid, or a being whose existence is more mythical and has not been confirmed (like the Loch Ness Monster, Yeti, or Chupacabra); a cryptozoologist is one who studies these beings. 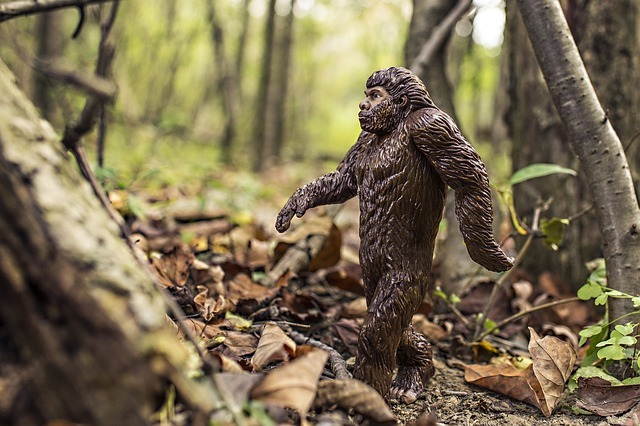 In the absence of information on the ‘squatch, many often compare BigFoot to his cryptic cousin the Skunk Ape since they are biologically similar in many ways (and there’s surprisingly a lot more research on the skunk ape), so perhaps we can make some deductions based on its behavioral traits. According to the Floridian-based Skunk Ape Research Headquarters (yes, you read that correctly), skunk apes retain an omnivorous diet, typically eating both small prey (like flightless nesting birds, fish, and deer) and large, including wild hog and even gators—they often hang around underground alligators caves and caverns. And when it comes to plants, skunk apes are willing to eat pretty much anything they feel like in the Glades—cabbage palm, pond apple, acorns, hog plums, whatever—so we can probably assume Big Foot isn’t too picky either. There are hundreds of different plants and fruits within the Pacific Northwestern region that he’d enjoy munching on. Whether you believe in Big Foot or not, I think we can all agree that if he exists, he would be open to eating beef jerky, in addition to the small animals and bountiful plant life that surround him. When in doubt, just know that Josh Elkin thinks he eats chocolate creme pies.